Dating back to 1981, the Fulton Playground is a small, fairly hidden getaway for kids located just inside of Golden Gate Park at 9th Avenue. Since the site faces southwest towards deYoung Museum and John F. Kennedy Tunnel, parents can easily explore other attractions in the park after letting loose for a spell at the playground. The playground is comprised of a mixture of plastic, metal and wood elements. Children can play on slides, swings, monkey bars and other climbing structures. One of the noted features of the Fulton Playground is the elaborate climbing structure equipped with a rope bridge for children to walk across. There is also an area at the playground for dog lovers to bring their furry friend for a day at the park. While visiting Fulton, perhaps you’d like to check out the JFK Pedestrian Tunnel located south of the playground – right under John F. Kennedy Drive. The design of the traffic bridge dates back to 1896 with details that offer a pleasant place to take a photograph. You can also walk from the playground to the Music Concourse using the pedestrian tunnel. Other attractions that are within walking distance to the playground include the award-winning Californian Academy of Sciences, and the blossoms and architecture of the Japanese Tea Garden. 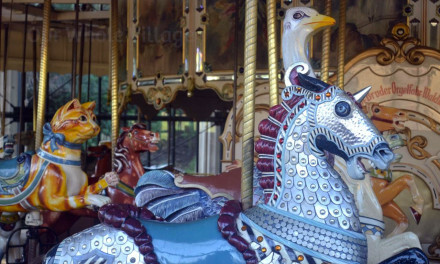 The Fulton Playground in Golden Gate Park is located between Fulton Street and John F. Kennedy Drive at 9th Avenue.